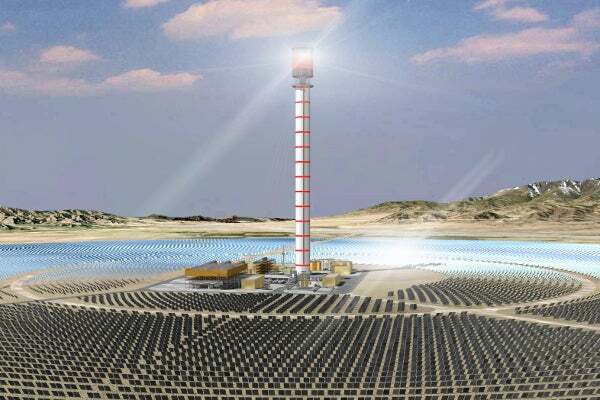 The Huanghe Qinghai Delingha Solar Thermal Power Project is an 810MW concentrating solar power (CSP) plant proposed to be constructed in phases at Delingha City, within the Haxi Prefecture in Qinghai Province, northwest China. The project is being developed by the joint venture (JV) of BrightSource Energy, Shanghai Electric Group (SEC) and the project’s majority owner Huanghe Hydropower Development (Huanghe), a subsidiary of the State Power Investment Corporation (formerly China Power Investment Corporation). The JV was officially formed in November 2014. The project will benefit from BrightSource Energy’s experience gained from developing its 392MW Ivanpah Electric Generating Station. The project’s feasibility report is currently being reviewed by Huanghe and the Qinghai Province Development and Reform Commission (DRC), following which the National Development and Reform Commission is expected to approve and recommend a tariff for Phase One of the project. The Phase One construction is scheduled to start in 2015 and is expected to be completed in 2017. It will involve the construction of two 135MW CSP tower plants integrating thermal energy storage. The output from Phase One will be sufficient to serve approximately 452,000 Chinese residences, and will offset carbon dioxide (CO2) emissions by 20 million tonnes over the project’s life. The project is also expected to generate approximately 1,200 jobs during the peak construction period and 80 permanent jobs during operations and maintenance. The solar complex will further enable China to meet its 2030 target of producing 20% of its overall energy from renewable sources. The overall project calls for the installation of six CSP tower plants rated at 135MW each. Phase One will cover an area of approximately 13km² (3,212 acres). Integrating BrightSource Energy’s CSP power-tower plant technology, the two 135MW CSP tower plants under Phase One will have a net output capacity of 628,448MWh a year. In a CSP power-tower plant, an array of computer-controlled mirrors called heliostats track the Sun in two dimensions and reflect the sunlight onto a central receiver that sits on top of a tower near the centre of the mirror field. Water is pumped to the tower’s receiver, where the boiler heats it to 1,000°F, and the steam generated in the process is used to power a conventional steam turbine to produce electricity. The project will further integrate a molten salt thermal storage facility, which will provide up to 3.5 hours of additional thermal energy generating capability during bad weather or at night. "The Huanghe Qinghai Delingha Solar Thermal Power Project forms part of the US-China Renewable Energy Partnership (USCREP), one of seven US-China clean energy initiatives announced by President Obama and former President Hu Jintao in 2009." Both BrightSource Energy and SEC will be involved in providing engineering, procurement and construction (EPC) services for the project, while the proven solar thermal power tower technology will be licensed by BrightSource Energy, and SEC will serve as the main equipment supplier. The Huanghe Qinghai Delingha Solar Thermal Power Project forms part of the US-China Renewable Energy Partnership (USCREP), one of seven US-China clean energy initiatives announced by President Obama and former President Hu Jintao in 2009. China and US are developing strategies for wide-spread renewable energy deployment in both the countries, under the programme. The two nations currently account for more than one-third of global greenhouse gas emissions.